Bucks Survivor Postponed ~ The Bucky Channel - The World of Sports from Wisconsin's Perspective. While this is normally the time of the year where we unveil the latest edition of our annual Bucks Survivor feature, I'm happy to say that this season it's going to be postponed. Usually we take a look at which Bucks should be voted out of Milwaukee first, Surivor style, at the end of every season, but this year the season isn't over quite yet. 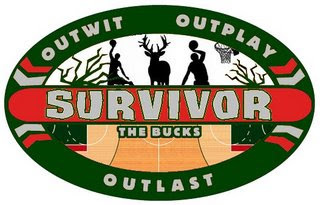 With the Bucks actually making the playoffs, we're going to postpone Bucks Survivor until the season is over. In the meantime, you can take a look back at the Bucks Survivor contests of the past, where Andrew Bogut was named the winner each time. Something tells me that he's the front runner to win this year too, especially with his injury likely having an effect on how we'll do in the playoffs. You can check it out though, as in year one he edged out Ramon Sessions, and last year he beat Luc Richard Mbah a Moute. We're not quite sure when the contest will start, but if you're like us you're hoping it starts later rather than sooner.